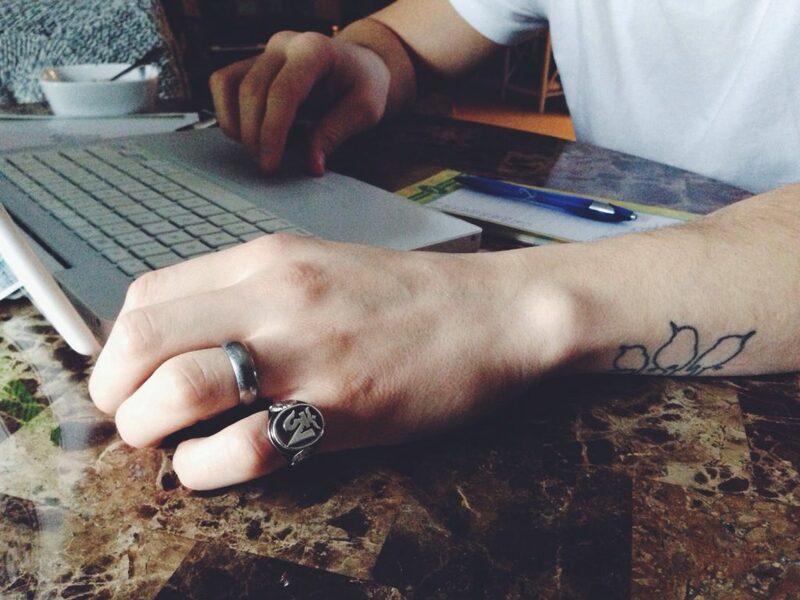 Clark has a really cool tattoo. Actually, he has three really cool tattoos. But it’s one in particular that I’m referring to: his three little birds. For those who don’t know, Bob Marley had a song called Three Little Birds. It has a peaceful rhythm and a catchy chorus. It’s stuck in my head more often than not, probably because Clark is usually walking around whistling it. The song’s meaning, or what it means to me, is something that I need to apply to my life. Recipes like this are just the ticket. Sometimes I feel like my head is going to explode. Like there is no way there should be this many ideas and thoughts and worries funneling through my neuro-pipelines at one time. It can’t be healthy. There’s the blog, there’s my job, there are my side gigs, there are friends and family. How does one measly 20-something find the time for it all? Yesterday I forgot my ID when I needed it to buy wine, the pair of boots that I drove 45 minutes to return, and my purse in the car when I went into the mall. Somebody pass the gingko biloba, please. I could’ve sworn my mind had another 60 good years left on it. This phenomena happens every so often and by now. It’s like my pot bubbles up and boils over when I’m trying to do too much at once. I’m slowly realizing that the secret to keeping it together is to simplify when and where I can and to not worry about the rest. Don’t worry. It seems simple enough, but it’s a difficult task in itself. You have to consciously think about NOT thinking about stuff. I always have the urge to come up with so many innovative dishes for the blog. A new take on something. A healthy version of a favorite. Oftentimes, this ends up being a complicated mess of stubborn. In my quest to come up with something “unique,” I am usually ignoring the fact that people love simple. Easy, accessible, healthy dishes that taste good have proven themselves to be this blog’s home runs, time after time. Our most popular recipes? 5-Minute Alfredo Sauce, Sweet Potato Hash Browns, Easy Spaghetti Squash Pasta. Quick, simple, easy. Once I forced the gears to slow down upstairs, I came up with this little gem of a recipe. 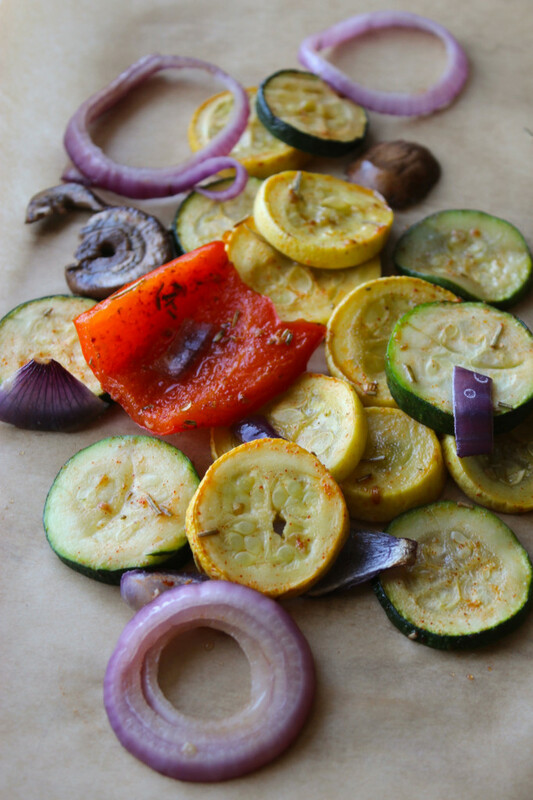 I wanted a bunch of colorful, healthy veggies and I wanted them to look pretty – simple! A drizzle of oil, a handful of seasonings, and a strategic stacking. A few minutes later – savory roasted perfection. After being speared together and placed in the oven, everything cooks all at once and is done at the same time. Set it and forget it. 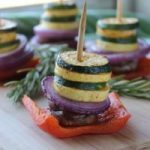 There was a little mess of veggies left over after making the stacks – those just went onto the baking sheet in a pile and made for delicious leftovers. Double win. Simple works best. In blogging, in life, in relationships, in cooking. There’s something to Bob Marley’s mantra “Don’t worry ’bout a thing, ’cause every little thing is gonna be alright.” You can hear the song a thousand times, but that simple, 13-word phrase is powerful enough to change your whole way of life. Do you have shoes on your feet? Clean water? A full fridge? A roof over your head? Good. Everything else is going to be alright. Shake off that one email that you forgot to reply to or that lunch date that you had to cancel. I’m reminding myself all of these things as I’m writing them down here, and I feel a little more mellow already. 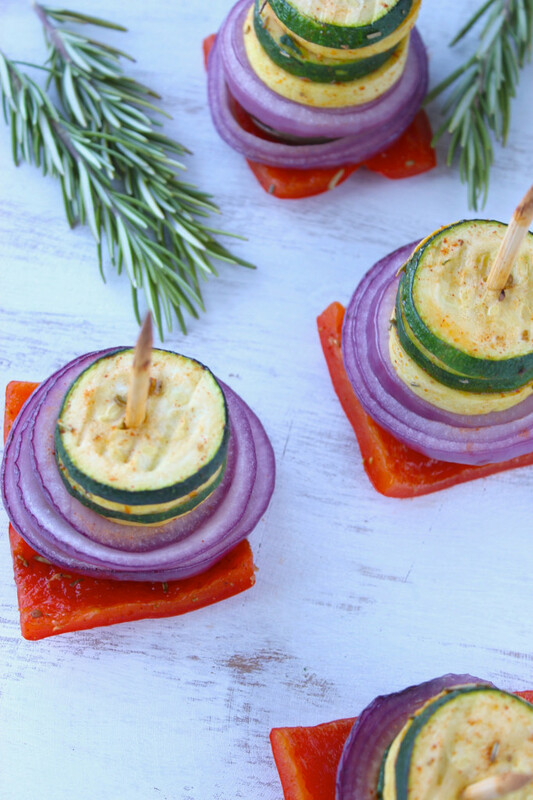 Easy appetizers made from healthy vegetables stacked and roasted in savory fashion. Enjoy. 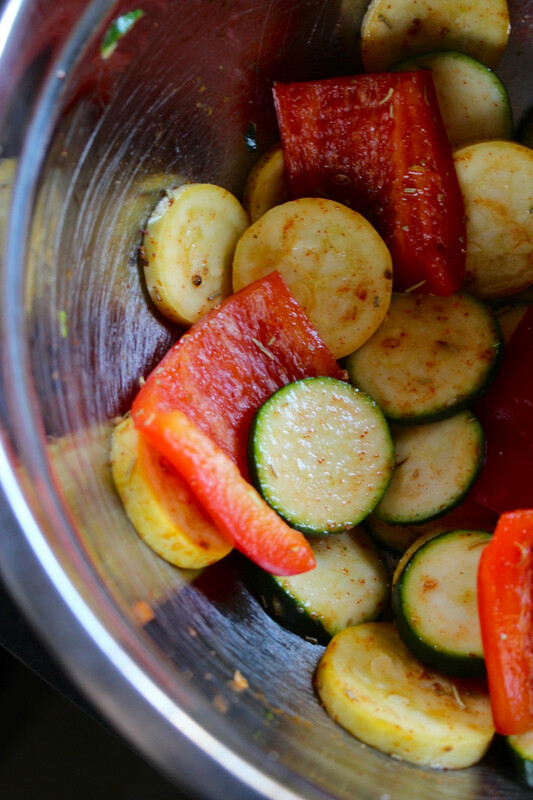 Toss zucchini, yellow squash, red pepper, and olive oil in a bowl with seasonings. 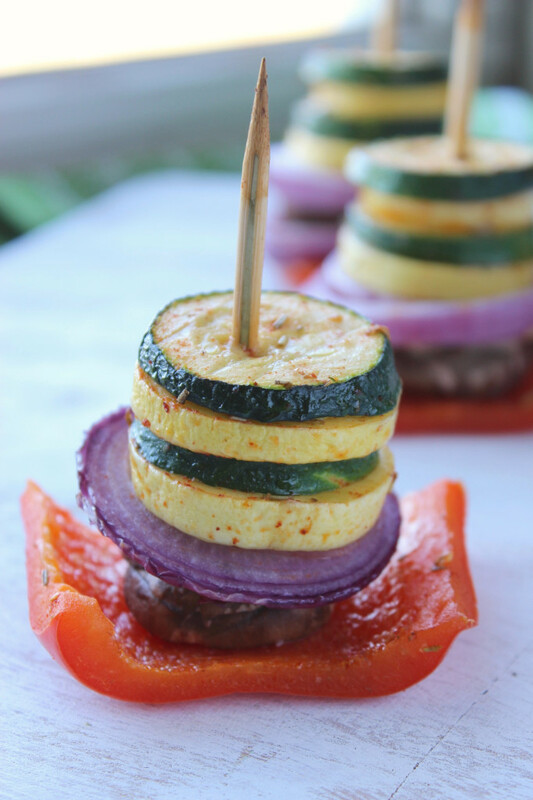 Using a wooden skewer, stack vegetables in this order (or however you prefer): red pepper, portobellow, onion, yellow squash, zucchini, yellow squash, zucchini. Bake the stacks for 20 minutes. Enjoy. 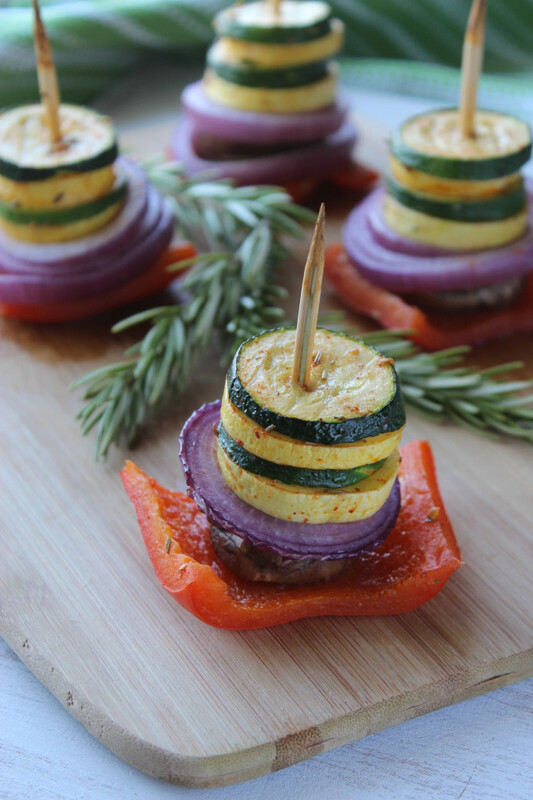 These look perfect for a make somewhat ahead side dish for a dinner party. Really pretty and healthy too! 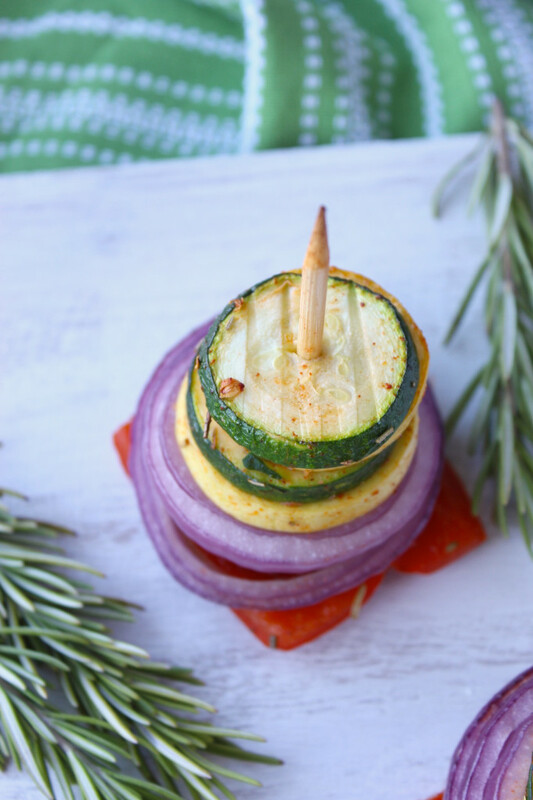 Perfect for using up those veggies I have in the fridge that are threatening to go bad! Thanks for sharing!